The massive Country Garden project with tens of thousands of luxury condos in Iskandar is roiling the real estate market in Johor Bahru. The buyers are overwhelmingly mainland Chinese and the Chinese government has restricted outflows of currency reducing the hoped for demand from mainland China for the project. The Beijing government has recently sharpened its tone on how its citizens are investing in property abroad, and tighten outflows of cash. Beijing’s move seems to have had an immediate effect. As of January this year, the number of Chinese firms invested in offshore properties had fallen by 84% compared to a year earlier, according to figures from China’s Ministry of Commerce. The Country Garden condos are now even being given away for free when a luxury condo is bought in mainland China. For Johor Bahru the massive supply of luxury condos from Country Garden adds to the already very large supplies that continue to be added to the Johor Bahru market. Downtown Johor Bahru with Danga City Mall on the left (looking North-West) in 2014. Some half a million of new apartments are in the pipeline over the coming years and the massive supply has had a negative effect on property prices in the region, according to Bloomberg. Average resale prices per square foot for high-rise flats in JB fell 10% last year, according to property consultant CH Williams Talhar & Wong. 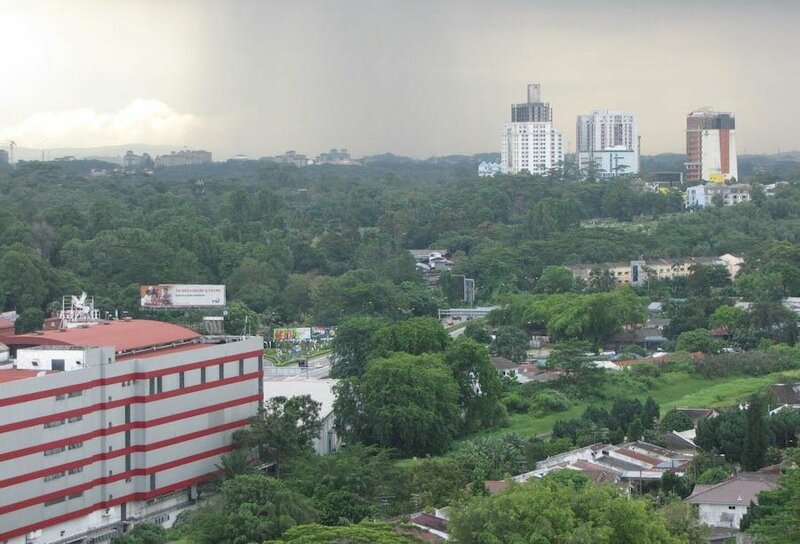 Global property consultancy Knight Frank in Malaysia warns that office and retail markets will continue to be under pressure with rental and occupancy due to oversupply. This oversupply are not a surprise to sensible investors. It was obvious years ago that the luxury condo market was being flooded with much more supply than Johor Bahru had shown the ability to absorb. The argument has been that an economic boom in Ishkandar would take care of everything. The problem is requiring a boom in order to have demand meet supply is a very risky condition for investors to accept. Still many did. The prices were low compared to expensive cities which entices investors. And the prospects for an Iskandar boom were not unreasonable. A strong global economy, sensible conditions in Malaysia with a desire to create good economic conditions in Iskandar and especially the proximity to Singapore offered good reasons to hope. If the building of luxury condos had been more constrained it is likely even today the prospects would be bright in that market. The prospects for Iskandar continue to be good. For real estate investors the main problem is that projects being delivered have exceeded real demand. Having investors speculate on future prospects can take on quite a bit of the extra supply for a while. But it is worrisome to see the current supply and the continued prospect for much more to be delivered very quickly. It is hard to see how enough investors can be willing to buy and hold for years at low rental rates (due to oversupply). The luxury condo market seems to be the most oversupplied. Other markets such as bungalows, malls and office supply are also areas to be wary. The key for Iskandar is to provide tens of thousands of new high paying jobs every year in order to keep up the demand. It doesn’t appear that those jobs are appearing at the rate the real estate supply is expanding. That, of course, is a risky situation for investors. One big problem delaying adding many more high paying jobs to Iskandar (and increasing the number of people willing to commute to such jobs in Singapore and live in Johor Bahru) is the transportation problems between Johor Bahru and Singapore. One proposal for the Singapore-JB MRT connection. 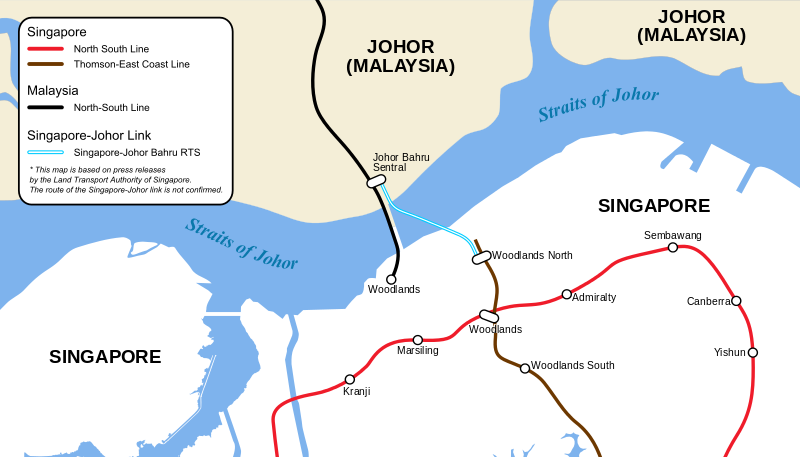 In 2015 the timeline for extending the Singapore MRT to Johor Bahru was extended to 2020. Now, the latest I have read is that it is being delayed further – until 2022. There is likely no other factor more important to reduce the supply demand imbalance for luxury condos than getting a good MRT solution into operation. Next would likely be a 3rd road link. Next is the need for adding many more high paying jobs in Johor Bahru than has been the case so far. These 3 areas should be the main areas of focus. The other issue, though on this things are probably too late to be managed properly, would be to reduce the pipeline of luxury condos being added to the market. As I said in the 2015 blog post, getting 1 station in JB connected to Singapore will be a huge benefit. For it to provide much greater benefit we should see at least 5 stations in JB and those must reach into the pockets of luxury condos to make those small submarkets in JB prosper. With a huge push to get the MRT in place as soon as possible and add a 3rd link and refocus on adding high paying jobs to Johor Bahru the prospects for JB and Iskandar remain bright. But the delay on those 3 fronts over the last 5 years along with the approval of far too many luxury condo projects leaves a large oversupply on the market for the foreseeable future. Convincing investors to buy and hold those properties can maintain prices for a while but the underlying economic realities have to be addressed to solve the oversupply problem. The prospects for Johor Bahru remain bright. But the delays on the improvements on transportation to and from Singapore and on adding high paying jobs have made the prospects less bright than they would have been if those matters had been moved forward more successfully in the last 5 years.